Looking for a simple chocolate ganache recipe? You're just ten minutes and two ingredients away from this rich, creamy & easy COOL WHIP Chocolate Ganache. Microwave ingredients in microwaveable bowl on HIGH 2 to 2-1/2 min. or until chocolate is completely melted and mixture is blended, stirring every minute. Let stand 15 min., then use to top cake, cupcakes or brownies. 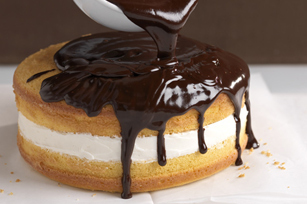 Ganache can be cooled 30 min., then spread onto cupcakes or other desserts as a frosting. A serving of warm ganache mixture can be spooned over ice cream for a delicious chocolate sauce. Or dip fresh strawberries in warm ganache. Desserts topped with ganache should be stored in refrigerator. Leftover ganache can be stored, in refrigerator, for up to 1 week.